March has been a busy month here at the Sisterhood of Salaam Salaam. Our members have been featured in the news from Washington State to Virginia to New York and beyond, and most recently, our teen chapters were featured in national and international outlets! March has also seen a rising up of the next generation, a capable group of young men and women ready and willing to fight for their rights, including their right to safety, and for the sake of peace and hope. We hope their message and voice can inspire us all. We welcome your feedback and hope you will send individual and chapter updates to samantha@sosspeace.org. In honor of Martin Luther King Day and the Reverend’s commitment to service, the newly formed Arlington/Alexandria chapter of the Sisterhood, led by chapter leaders Natalie Roisman, Fatima Argun, and Julie Rosenberg, joined forces with several hundred volunteers in Northern Virginia for a day of giving back to the local community. Natalie Roisman recounts the experience. 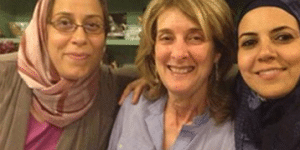 Olivia Rotter is passionate about the work of the Sisterhood of Salaam Shalom®. 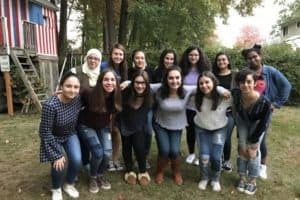 After attending the annual conference in November and witnessing firsthand how transformative the experience of interfaith exchange can be, she set out to bring the mission and model of the Sisterhood to a new community- that of teenage girls. 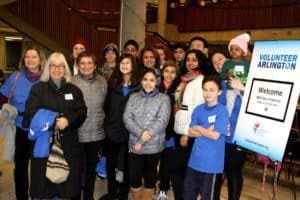 In describing her experience of co-leading a teen chapter in her hometown, she says, “I wanted my own Jewish community to see the power of togetherness and to recognize our strong similarities with Muslims…Ultimately, I wanted to break racial and religious barriers within my community — and that is exactly what we are doing when my chapter meets.” In honor of International Women’s Day, Olivia chronicled her experience in Teen Vogue. Recently, Heba Macksoud, a chapter sister in New Jersey and a member of the Board of Directors, reflected on her experiences with the Sisterhood. She spoke of breaking down stereotypes, building bonds within a diverse group of women, and of course, the importance of celebrating holidays with food. 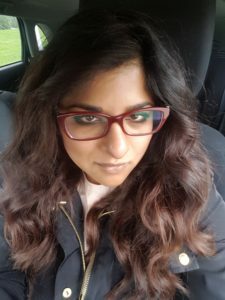 In her own words, Heba says, “I often hear from people that they are not happy with the current state of divisiveness that has plagued our country, but they are not sure what they can do about it. 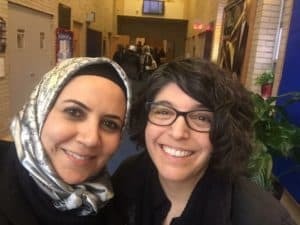 The Sisterhood of Salaam Shalom® has created a framework for women to bond together and then commit to resolving some of this hateful rhetoric.” Read more of Heba’s story in an op-ed written for The Star-Ledger. Bonnie Mandel didn’t grow up in Spokane, Washington, but living there, she missed the diversity and and cultural exchange of her hometown. After hearing about the Sisterhood, she found a partner in Saima Ahmad, a woman she knew professionally, and together, they formed a Sisterhood chapter. 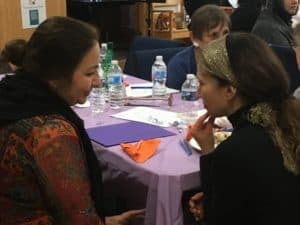 This month, Bonnie wrote about her Sisterhood journey, eye-opening, intra- and interfaith dialogue, and developing a community of new, female friends, for The Spokesman-Review. 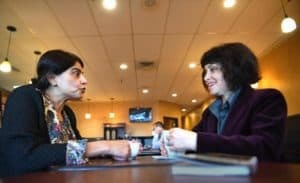 In a recent editorial for Global Citizen News, Edmonton chapter member Naz Qureshi spoke of the importance of sharing one another’s stories, both personal and cultural, as a form of engagement and relationship building. She explored the role of dialogue as a tool for transformation and acknowledged that empathy, courage, and understanding–both the desire to be understood and the desire to understand–drive successful Sisterhood interactions. Stay tuned for upcoming dates and locations in Philadelphia and Kansas City! Mark your calendars! Please plan to join us on Sunday, November 4, 2018 at Delaware Valley University in Doylestown, Pennsylvania (outside of Philadelphia). A special pre-conference concert and dessert reception will take place on the evening of November 3. Early Bird registration will be opening in April. Keep an eye on our Facebook page for details!